Hormonal contraception is a birth control method that acts on the endocrine system. Several types of female hormones are used to prevent ovulation and avoid fertilization. Hormonal contraception also results in changes in the uterus making it unlikely to develop pregnancy. Globally, an increase in adoption of hormonal contraception for birth control, rise in female population on a global level and implementation of temporary and low cost contraceptive practices instead of permanent contraception are the prime growth drivers of hormonal contraception. The major opportunities for the growth of this market are urbanization and increased consciousness about hormonal contraception and the policies setup by the governments to promote hormonal contraception. However, adverse side effects related to the use of hormonal contraceptives is the key restraint for the hormonal contraception market. This report identifies the global hormonal contraception market size in for the year 2014-2016, and forecast of the same for year 2021. 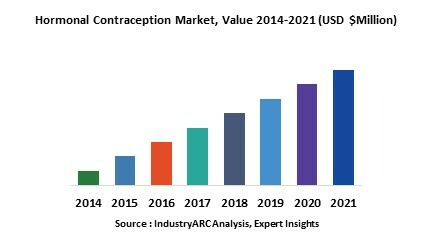 It also highlights the potential growth opportunities in the coming years, while also reviewing the market drivers, restraints, growth indicators, challenges, market dynamics, competitive landscape, and other key aspects with respect to hormonal contraception market. Geographically, Asia Pacific dominates the hormonal contraception market, and is projected to have the fastest growth, owing to growing population in this region on a global level. This is report has been further segmented into major regions, which includes detailed analysis of each region such as: North America, Europe, Asia-Pacific (APAC) and Rest of the World (RoW) covering all the major country level markets in each of the region. The major countries considered under the Asia-Pacific region are India, China, South Korea and Japan. The major countries considered under the European region are Germany, U.K., France, Italy, Spain and Russia. The major countries considered under the North American region are United States, Canada and Mexico.